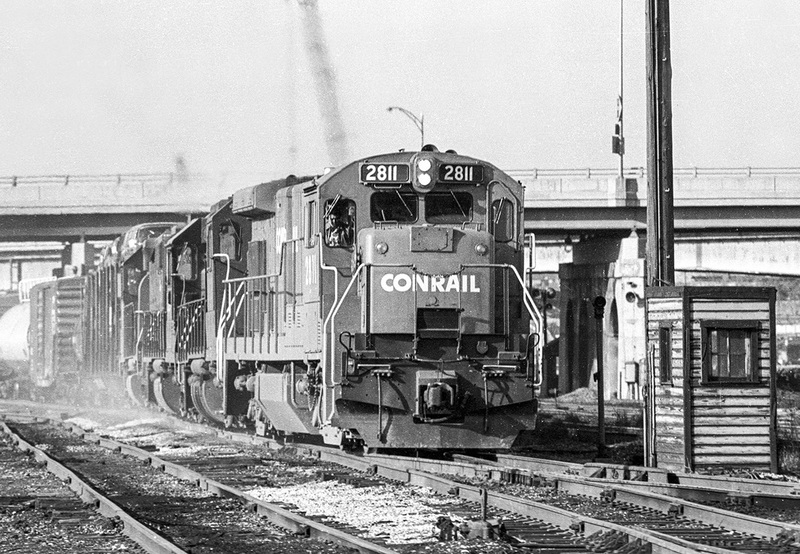 A Conrail Type B23-7 No. 2811 with an eastbound freight crossing under the Fourth Street Bridge and nearing US Tower in Columbus. Photo by Jon Bentz, 1977. 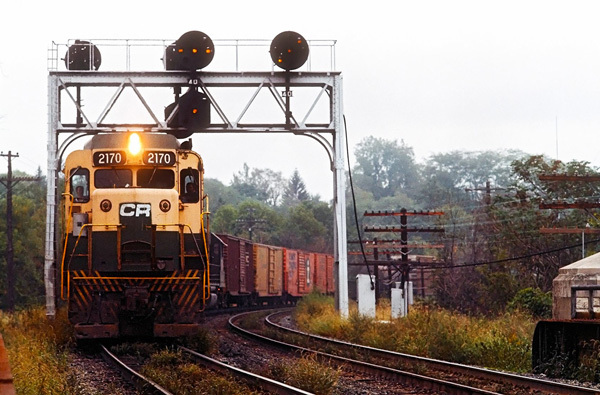 Same eastbound train picking up orders from the US Tower operator. Sometimes the switch tender would hand up the train orders. No. 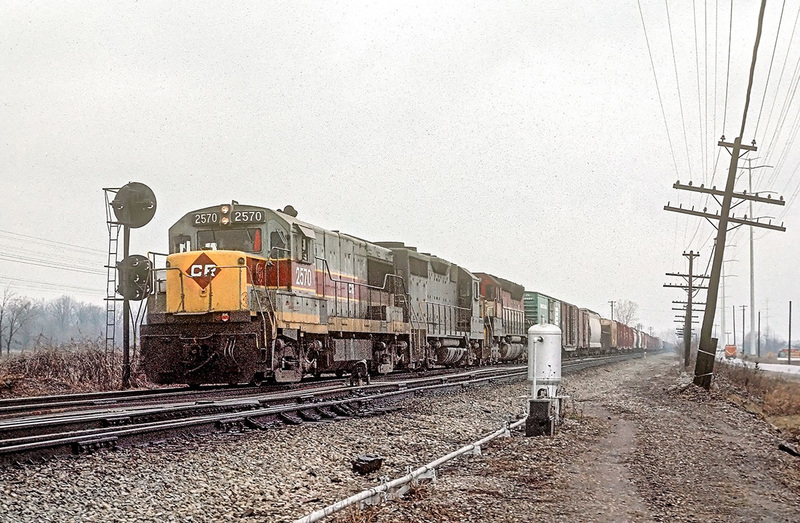 2811 has just entered the joint PRR/B&O, now in 1977 Conrail/Chessie System, Newark Division. Photo by Jon Bentz, 1977. 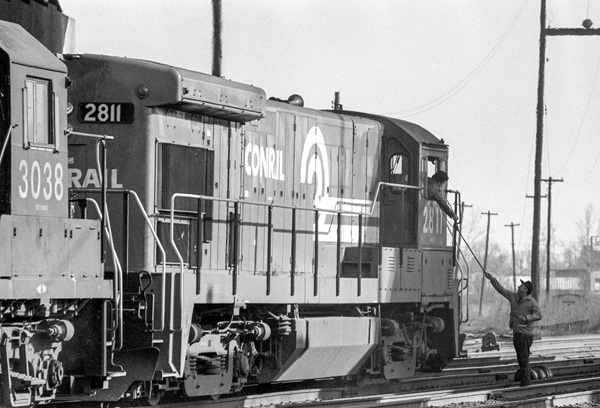 Conrail No. 2570 (ex-Erie Lackawanna 2501) eastbound on the ex-PRR Bradford Line in Hilliard. Photo by Jon Bentz, 1977. 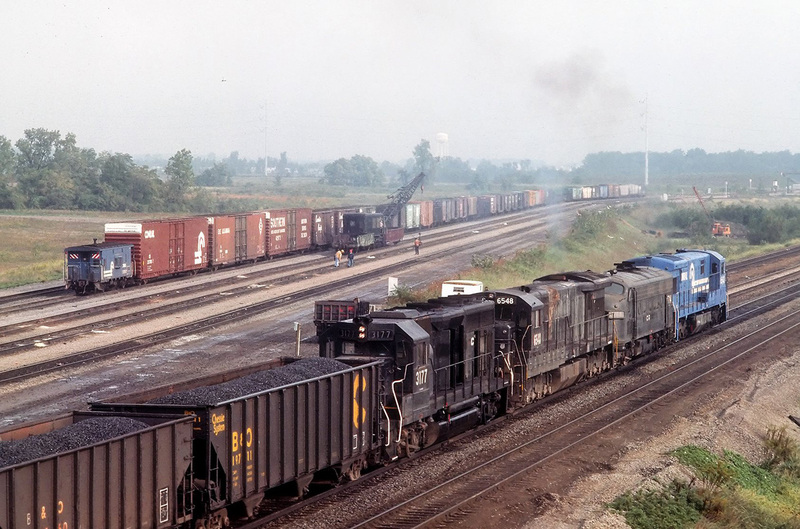 A mix of power leads an eastbound freight out of Buckeye Yard while MOW works on the receiving side of the yard. Photo by Jon Bentz, 1977. Westbound Conrail GP30, No. 2170 (ex- Reading 5502) just about to pass over Route 33 west of West 5th Avenue on the ex-PRR Bradford line. Photo by Jon Bentz, 1977. Conrail executive E8A No. 4022 leads the westbound National Limited as it approaches West Jefferson on the ex-PRR Bradford line. 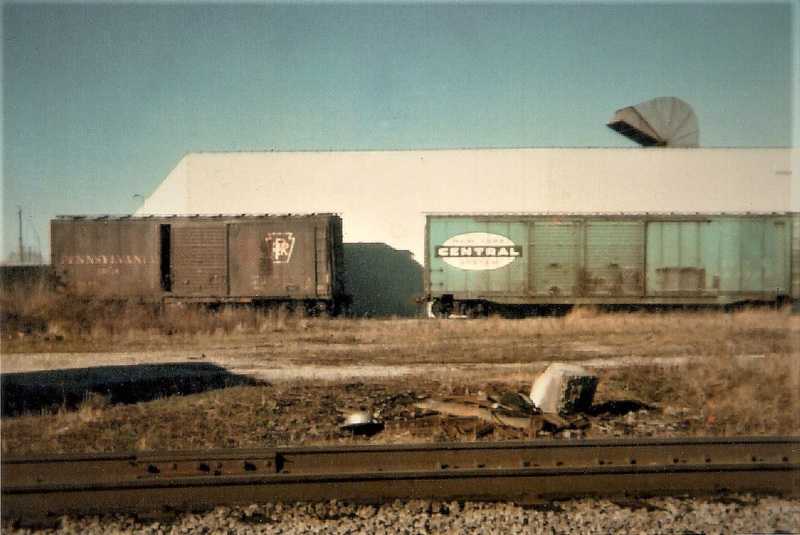 Photo by Jon Bentz, circa 1977. The Red and Green teams share a siding on the Lake Street loop in Delaware, Ohio. They weren’t dressed in their finest. Photo by Paul Monks, circa 1970. 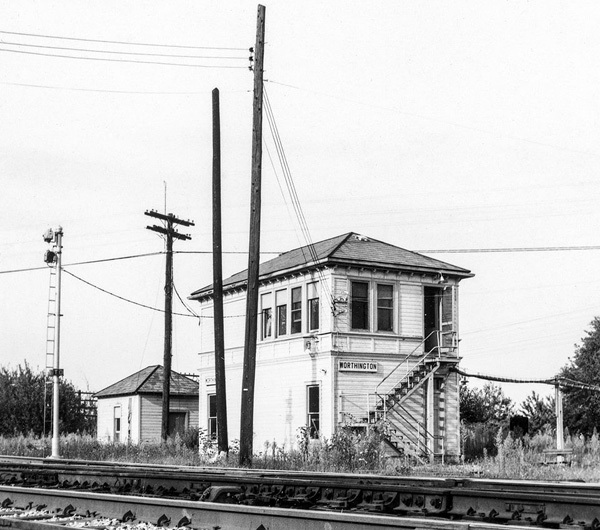 When the Norfolk & Western took over the PRR Sandusky Branch in 1964 they acquired the Worthington Tower. Several windows including four on the west side of the building and one on the east side were covered with siding and the entire building painted. It looks like the armstrong levers may have been replaced. 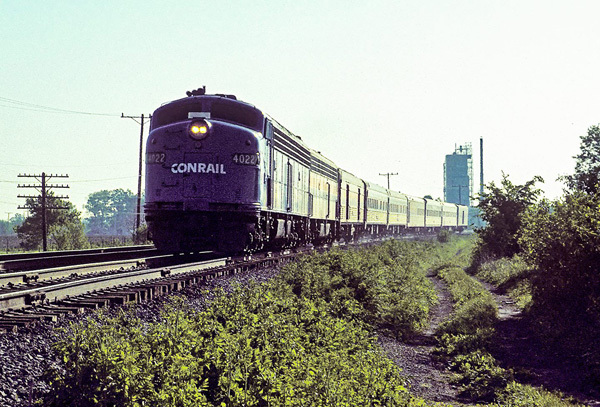 Photo by Jon Bentz, circa 1965.